Saturna Island Parks ~ Lyall Harbour Bed & Breakfast, Saturna Island, British Columbia, Canada, A quality gulf island accommodation. Almost one half of Saturna's stunning landscape of bays, valleys and high rock bluffs are protected within the Gulf Islands National Park Reserve (GINPR). 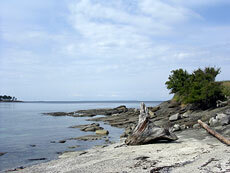 The GINPR mandate is to preserve the valuable ecosystems and natural habitats in the Gulf Islands. 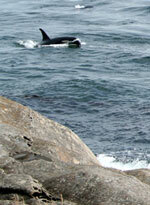 It also ensures that large areas of Saturna will remain undeveloped for future generations. Most of the GINPR areas are accessible by road or a small hike, and the scenery is simply spectacular. Exploring the national park reserve is best done at a leisurely pace and in ways that leave little or no trace of your passing through. In addition to the GINPR, Thomson Park is a small community park at Saturna Beach. There is also public beach access at Veruna Bay, located just west of Winter Cove. East Point is a small but spectacular marine park at the eastern tip of the island. Easily accessible by road, the former grounds of the Saturna Island Light Station was acquired by Parks Canada to become part of the GINPR. Most of the park is a grassy bluff, leading down to a small unsupervised swimming beach, and a fabulous area of eroded sandstone rock formations. 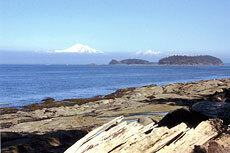 There are also magnificent views of Boundary Pass and the San Juan Islands. The western side of the park has high cliffs where you can curl up and bask in the warm sun, and where a local pod of Orcas regularly passes through in the summer months. The Lyall Creek Trail can be accessed from both its highest point on Narvaez Bay Road and from Valley Road in the heart of the valley. The relatively short hike features a scenic waterfall near the top of the trail and passes through a beautiful forest area with ferns and mosses. The trail is steep and for the sure-footed. At 397 metres (1,303 ft.), Warburton Pike is the second highest point of land in the Gulf Islands, and one of the most spectacular viewing points. Panoramic views of the neighbouring gulf islands, Vancouver Island, and Boundary Pass are simply breathtaking. There are soaring eagles, ravens, and feral goats to be seen, and many of the trees along the rock-bluffs are original old-growth.This is also the start of the Brown Ridge Trail, and hikers are reminded not to go near the cliff edges. Access to Mt. Warburton Pike is via Harris and Staples Road. Narvaez Bay is one of the most beautiful and least visited areas in the Southern Gulf Islands, although the park is easily accessible from a hiking trail at the end of Narvaez Bay Road. The beaches at Echo Bay and Little Bay are wonderful places to relax and enjoy nature, or watch the freighters passing through Boundary Pass. 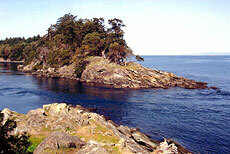 Russell Reef is a shoreline reef along the north coastline of Saturna. Located not far from Winter Cove, access to the shoreline is through a small parking area on East Point Road. There are splendid views along Georgia Strait, and the reef contains many inter-tidal pools rich with sea life. Please be sure to respect the natural habitat of this area. While not a park, the end of Lyall Harbour has a small pebble beach with public access. During the summer months, fantastic sunsets can be seen from the harbour, looking up Navy Channel between Mayne and Pender Islands. Located on the south side of the island, Taylor point is a spectacular area with stands of old growth trees, large rock formations and a sandy beach. It is the original site of a sandstone quarry and barge dock, with historic remnants of a stone house built by the quarry owner George Taylor in 1892. Sandstone from this quarry was used to build the Victoria Legislature buildings. Public access is by kayak or small boat only, and the land surrounding Taylor Point is private property. There are no facilities. Thomson Community Park is located on the south side of the island at historic Saturna Beach, the original site of the July 1st Lamb Barbecue. This is a fantastic part of the island to explore, although much of the surrounding land is private property. Access to the park is from Harris Road, or by boat or kayak. A short walk up from the park will take you to the Saturna Island Vineyards. Winter Cove Park is one of the most accessible and well visited parks on the island. It is also one of the most scenic with much natural diversity in a small area. A well established loop trail will take you to the point at Boat Passage, with breath taking views of Winter Cove, Samuel Island, and the Strait of Georgia. 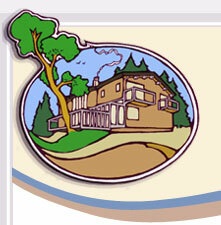 There are washroom facilities, picnic tables, as well as boat moorage in Winter Cove. The baseball field across from the park, a former shale and aggregate plant, is the site of the renowned Saturna Lamb Barbecue on July 1st Canada Day.